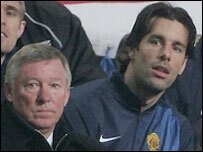 Will Ferguson regret Van Nistelrooy's farewell? Ruud van Nistelrooy is the latest Manchester United star to find a deteriorating relationship with Sir Alex Ferguson always ends at the Old Trafford exit door. Ferguson has seen off Jaap Stam, David Beckham and even Roy Keane, who were on the one-way route out of Manchester United once they crossed the immovable object that is Sir Alex. And yet, in this instance, it seems the intransigent attitude of a typically single-minded Dutchman played as big a role in the departure of a striker with the magnificent record of 150 goals in 219 games. Ferguson insists he is mystified as to why Van Nistelrooy became so unsettled at United that he asked for a move shortly before the 2005 FA Cup final defeat against Arsenal, repeated the request through his representative, then finally put it in writing himself. It has been a messy end to a union that was once so productive, but it remains to be seen whether United will live to regret allowing Van Nistelrooy to join Real Madrid in a reported £10.2m deal. 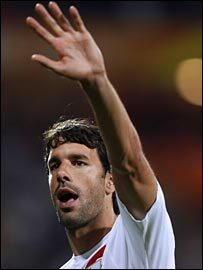 Van Nistelrooy's appearances were limited last season, especially after Ferguson made it clear he was playing second fiddle to Louis Saha after axing him for the Carling Cup final win against Wigan. And yet he still amassed 21 goals in 35 league games, finishing second top Premiership scorer behind Thierry Henry. This was over-shadowed by Van Nistelrooy storming away before United's final league game against Charlton - and subsequently being told he was not welcome at Keane's testimonial. After the Charlton disappearing act, Ferguson explained: "There have been a couple of issues during the week that concerned us in terms of the spirit of the club." Van Nistelrooy's World Cup was a different story, dropped with some very public and pointed criticism from Holland coach Marco van Basten after scoring one goal and finding himself substituted in all three group games. Was this merely the result of an unsettled season at Manchester United or has Ferguson pitched it right and the once-great striker is in terminal decline? If Ferguson has failed to make the right call - or does not have a credible alternative up his sleeve - it could deal a fatal blow to both United's title ambitions and his own managerial longevity. Wayne Rooney, for all his brilliance, is not a natural marksman and will hover more in 15-20 goals a season territory. Alan Smith is recovering from a broken leg, Ole Gunnar Solskjaer is working his way back from two years of injury - and Saha spends too much time in the sick bay. Van Nistelrooy's departure does at least remove a brooding presence from United's dressing room, having had public fall-outs with not just Ferguson, but also Cristiano Ronaldo. But for all the baggage attached to Van Nistelrooy in his final months at Old Trafford, he remained one of the most potent marksmen in the Premiership. United can hardly claim to have done a good deal financially either, because they will not find another Van Nistelrooy for the £10m thought to have been handed over by Real. This season is crucial for United and Ferguson - he cannot get the big decisions wrong or Chelsea will be even further over the horizon, Arsenal will close again and Liverpool may even pass their great rivals. 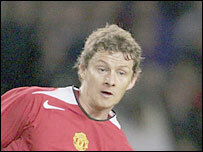 Ferguson's recent buying record is sketchy at best, and the Van Nistelrooy affair has put this into even sharper focus. As Van Nistelrooy prepares to be paraded at the Bernabeu, Ferguson must hope he has got the selling and buying right - his and Manchester United's future may depend on it.